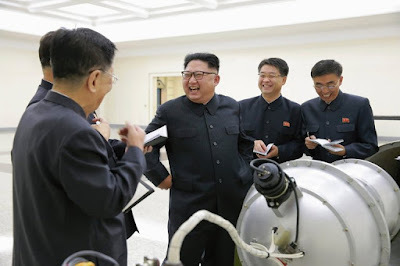 The Guardian News commentary -- north korea Will North Korea’s Nuclear Weapons Help Prevent War? Will North Korea’s Nuclear Weapons Help Prevent War? Atomic bombs are proving to be blessings for small nations that face enemies with far superior conventional and nuclear forces. This is especially true of North Korea, which expects to reap nuclear peace dividends, as fiery rhetoric gives way to cool heads. Over the past 20 years, nuclear weapons have prevented at least three potentially big wars: between India and Pakistan, between Russia and Nato, and between the US and North Korea – as well as China by extension. Nuclear bombs have also helped avoid major confrontations between Israelis and Arabs as well as Iranians. If more small countries had nukes, countless lives possibly could have been saved. If Afghanistan had atomic bombs, for example, Afghans could have avoided the 40 years of mayhem since the Soviet Union’s invasion of their country in 1978. If Iraq had a nuclear arsenal, one million Iraqi lives and some 5,000 American lives could have been saved. Nukes are, in fact, the chief deterrent to all-out war. WNU Editor: B. Z. Khasru believes nuclear weapons will restrain Kim Jong-Un and stop his adversaries from having him overthrown. I see the opposite .... nuclear weapons with a delivery system will embolden him, and it will force the major powers to make decisions that carry great risks to everyone in the region.